She would sometimes spend more than eight hours a day, seven days a week, watching otters, and one threat to them became clear: The places that are good for otters — bays, estuaries and harbors — also attract people. Too often, kayakers would paddle too close to a raft of otters and cause them to dive or flee. Bentall is now the program coordinator for Sea Otter Savvy, a nonprofit that educates people about how to safely be around sea otters. What Bentall saw happening to the otters is a common occurrence in areas like the Monterey Bay, where growing populations of both humans and wildlife meet. Some of the biggest dangers posed by people to wildlife can seem innocuous — a kayaker gets a little too close to a raft of otters, tourists take an extra step to get a hauled-out sea lion into camera frame. But these interactions are anything but harmless. They’re disturbances and stresses that can endanger the very animals that people are there to see. In 1972, the United States passed the Marine Mammal Protection Act, which makes it illegal to “harass, hunt, capture, or kill” marine mammals like seals, sea lions, otters and whales. But the term “harass” is broad. According to the MMPA, harassment is anything that causes “disruption of behavioral patterns.” In other words, if you’ve done something that causes a seal to change its behavior — even lift its head to look at you — that’s illegal. If you do something that causes a seal to dive or wriggle off the beach, that’s very illegal. That may sound extreme. After all, if an otter had to change its behavior once a week because of a nearby person, that might not be a big deal, says Jim Harvey, director of Moss Landing Marine Laboratories, but these disturbances add up. Bentall says that in some locations she’s seen this happen 20 times a day to sea otters. While seals and sea lions have blubber layers that act as both an energy source and insulation, sea otters have none of that. Instead, they create insulation by trapping bubbles of air in their thick fur. That requires five to six hours of intensive grooming, and once that’s done they have to spend eight hours foraging and eating. Mike Harris, a senior environmental scientist and sea otter biologist with the state Department of Fish and Wildlife, says that a mother can expend so much energy raising their pup that once it’s weaned, it doesn’t take much to push them over the edge. It’s called “end-lactation syndrome,” and it can kill mothers even without human interference. Bentall calls this “death by 1,000 kayaks.” The impacts on seals and sea lions are harder to determine, but still real. In 2015, an El Niño event caused sardine and anchovy populations to plummet, and sea lion populations took a hit. Some days, she says, she spent six hours asking people to move away. People are equally bold when it comes to local seals. Despite fencing and “No Trespassing” signs, visitors still try and slip through the fence at Hopkins Beach, an important rookery for pregnant harbor seals. 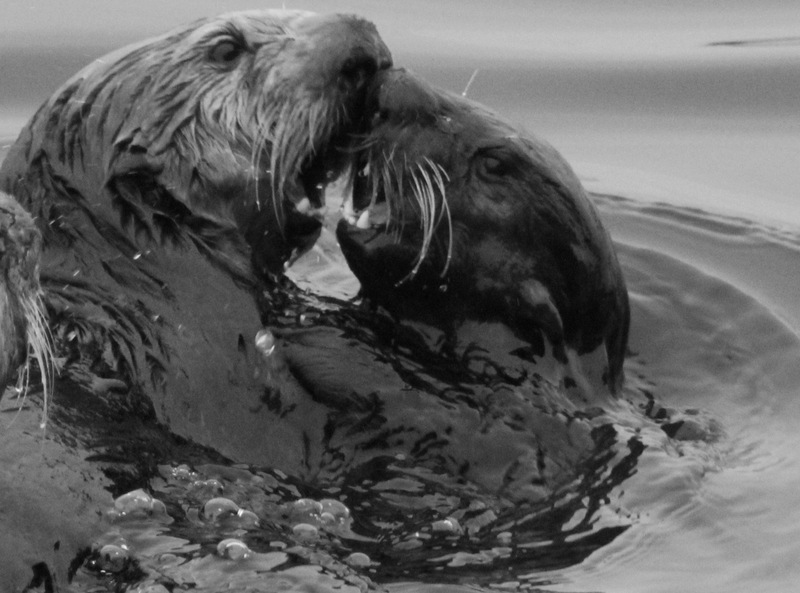 By working with Bentall and Sea Otter Savvy, Monterey Bay Kayaks has developed a three-step plan to try to mitigate the impacts to wildlife. One is to foster empathy — Furey says that they talk with every person individually about the fact that, in a kayak, you’re in the animals’ habitat. Second, he gives his customers tips to avoid disrupting otters, such as to paddle parallel to otter rafts, not at them, and stay five boat-lengths away. Third, he reminds visitors that people are watching. “People don’t always respond to empathy and have to be told it’s the law,” says Furey. These steps might cut down on the amount of disturbances on a kayaking trip, but Bentall’s goals are much bigger. Bentall is working with agencies, organizations and businesses. She’s speaking at local events (“I try to talk to a group of people at least once a month”) and emphasizing the importance of peer-to-peer communication. She’s seen some promising signs that their work is making a difference, but emphasizes that it’s too soon to say. She hopes that these ideas — to respect an animal’s space, to think about an animal’s needs before our own desires — will spread enough to become self-sustaining. Eventually, she hopes that she won’t need to worry about how animals and humans interact at all.